At the end of State Road 170 and just past a ghost town lies Artemis, population 2,500. The townspeople had sought out this remote corner of Western Texas in hopes of living lives of solitude and independence. None of them realized that their small town would become a hot spot for Mexican drug runners, whose turf battles have turned both sides of the Rio Grande into a war zone. Still, many of the locals would rather take the law into their own hands than get help from police chief Josie Gray, even when they're up against a cartel's private army. After arresting one of the cartel's hit men and killing another, Josie finds her life at risk for doing a job that many people would rather see her quit. And when the town's self-appointed protector of the Second Amendment is murdered and his cache of weapons disappears, it's clear that she doesn't have to pick sides in this war. She's battling them both. 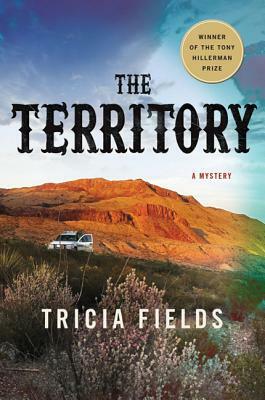 Set in a desert landscape as beautiful as it is dangerous, The Territory captures the current border issues from the eyes of a tough, compelling heroine and richly evokes the American Southwest. Tricia Fields lives in a log cabin on a small farm with her husband and two daughters. She was born in Hawaii but has spent most of her life in small town Indiana, where her husband is a state trooper. She won the Tony Hillerman Prize for her first mystery, The Territory, which was also named a Sun-Sentinel Best Mystery Debut of the Year.